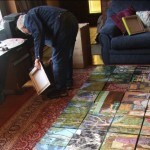 2012 was the 60th anniversary of the founding of the Box Hill Art Group. 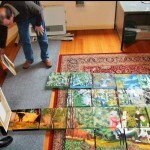 To commemorate this event the Group produced a large painting, depicting places, events and artists involved in the history of painting in the vicinity of Box Hill. 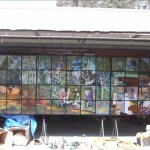 It is made up of 60 panels, each one foot square making a picture four feet high and fifteen feet long. Sixty members, past members and tutors of both the Box Hill Art Group and our sister group the Whitehorse Arts Society participated by painting a panel. The final picture was “assembled”, panel by panel, at the opening of our Annual Exhibition in September 2012, which was the Official Celebration of this significant Anniversary. The Painting has been installed on the south wall of the Drycraft West studio at the Box Hill Community Arts Centre, the studio which the Box Hill Art Group has used for since the inception of the Centre.